It's remarkable that film has lasted as a medium for more than one hundred years when you think of all the entertainment formats that have arisen and faded away in that time. That fact doesn't make the decline of cinematic celluloid much easier for many of the collectors who have devoted themselves to collecting 16mm and 35mm reels. 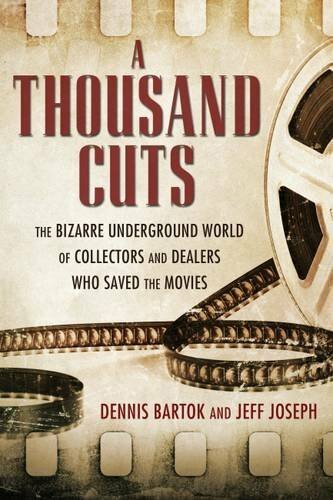 In a new book, Dennis Bartok and Jeff Joseph immerse themselves in the quirky, devious and eternally fascinating world of the film fanatics who collected, stole, shared and sold reels of everything from cinematic masterpieces to cartoons, nudie cuties and television programs. A Thousand Cuts is essentially a series of interviews with various collectors, each of them given a spotlight in which to tell their story. While many of the (mostly) men in this community know each other, and refer to one another in their talks with the authors, it is interesting that they are profiled separately, each providing their own unique take on the phenomena of collecting and its decline. In addition to their biographies, Bartok, who was principal writer on the project, offers a detailed analysis of his subjects, examining their surroundings, the way they look and how they speak. You sense him judging them on occasion: the piles of belongings in their homes, the sound of their voices, the choices they have made to devote themselves to film, but for the most part he seems to feel affection for these lovers of cinema. The interviewees include some who are famous, or even notorious, but most of them are best known among other collectors and the members of the film industry. It was interesting to get a closer look at the collector side of Leonard Maltin, who is best known for his books and reviews, and the chapter in which Robert Osborne reminisces about the film collection of his friend Rock Hudson had some wry insights that made me miss his presence as a TCM host. It was also wonderful to learn more about the fastidious Kevin Brownlow and his quest to rescue Abel Gance's silent epic Napoleon (1927). These three are among the less eccentric characters in a book full of people so devoted to film that they will lie, steal and screw each other over to get the prints they want. While Bartok establishes early on that most collectors are white, gay, unmarried men, he goes beyond that majority to profile some of the atypical members of the community. There's Rik Lueras, the only prominent Latino collector, and one of the rare happy family men, and Hillary Charles, one of the only women to have been active in the scene. He also features enthusiasts with a particular obsession within their film fanaticism, including Mike Hyatt, who spent decades restoring and protecting the legacy of Day of the Triffids (1962) and Mike Vraney of Something Weird video who admits he champions "beneath the barrel" sexploitation and horror flicks. There are also the young collectors who continue to preserve and honor 35mm, if not in as great numbers. At times I felt disgusted reading about the devious acts of some of these collectors and occasionally I found myself also judging the way some of them discarded everything else in life to live for film, but in the end I felt I better understood the attraction of collecting. Bartok takes you inside that passion, giving you a feel for its sensory pleasures and the victory of preserving something that would otherwise be lost. You also begin to understand that often collectors collect because they can't help themselves and that pull will always to some degree remain mysterious to those on the outside of their obsession. Many thanks to University Press of Mississippi for providing a copy of the book for review. This sounds like a fascinating book! I will definitely have to read it! BTW, the same thing kind of happened in the TV community. There are some pretty obscure shows and not so obscure shows that were largely saved by collectors. It was interesting Terry. You really get a feel for that world. A lot of the profiles include some reference to TV collecting, and there's even an entire chapter devoted to a collector who specializes in TV. 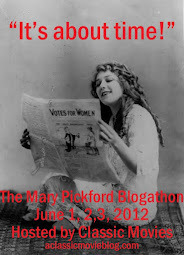 I think you'd like it.